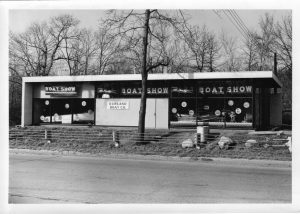 In 1954 Newton Durland started his own boat store. The shop was unique because it was not on the water or near a Marina. 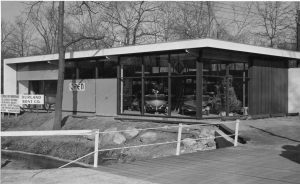 Situated on a busy highway — Route 59 in Nanuet NY —the store became a unique and frequent stop for boaters. Pleasure boating was a fairly new hobby at the time, but Durland Boat Company flourished. Boating as a hobby was becoming more than just a rich man’s sport. The above photo shows the store open for Christmas in 1954, featuring 1955 Johnson outboard motors and Whirwind boats that were molded mahogany. The store today, 2017, is a little taller but same foot print. Now it’s a bank. The above photo was from one of the many eventful boat shows. Featured boats were wooden Lyman boats and Alumacraft aluminum boats. 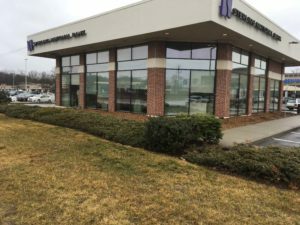 The above photo was taken of the store in 2017, same original footprint and location of DBC. A very large strip mall was built behind it in the late ’50’s.